What's in the Bible? takes a look at Christian principles for the under 5s. Illustrated throughout, it is the latest title in the God and Me series. 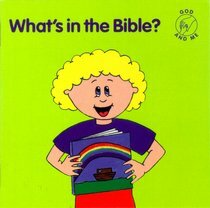 About "What's in the Bible? (God And Me Series)"
She is a teacher of elementary age children who also has four children of her own. Each of these colourful and attractive spiral bound books give girls over 100 devotionals to help them grow closer to God. GOD AND ME! BOOKS Each of these colourful and attractive spiral bound books gives girls aged 2 to 12 more than 100 devotions to help them grow closer to God.